Give the gift of Prepaid Sewing course! Suprise your loved ones and get them the perfect Birthday or Christmas gift. If your mother, sister, daughter, brother or a friend is ‘arty’ and ‘crafty’ person this is a perfect gift for them! 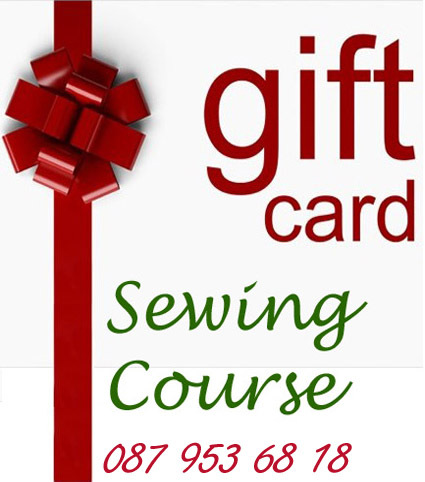 We offer gift cards for our Sewing Classes. You can purchase voucher for any amount, for all the courses and workshops. You can buy a voucher for a certain amount and the lucky person will be able to sign up for any course up to the value of the Voucher. On the purchase of the Gift Card we will send you a signed voucher with the name of the course(s) and available dates. Complete Flexibility on the choise of course. Certain conditions might apply as I have a limited number of places on our courses. Available dates are also on the website and booking in advance is advised. W: fill in our contact form and I will get back to you immediately and advise on the type of the sewing courses and sewing classes available.